2 roses blooming side by side. A good symbol of partnering together in ministry. A comment on the photo. 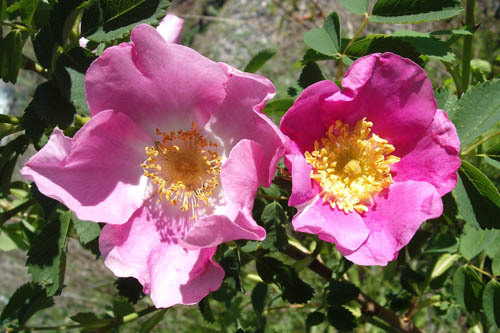 Pink roses are some of the oldest known roses. Roses symbolize love and gratitude. Dark pink especially signifies gratitude and appreciation. As a religious symbol in the Church, pink roses signify hope and joy in the salvation, true life, and happiness Christ brings. Like roses in bloom, we often admire their beauty, but don't think much of the thorns. And all the hard work involved, planting, watering, feeding, weeding, and pruning -- and getting scratched. They are some of the unsung heroes in a parish. They can be "stars" in God's Kingdom. They have have an important ministry to God, husband and family, and then, in various degrees, to the parish itself. What most don't see, it's a very difficult vocation, deserving of genuine thanks, appreciation, and support. Maybe you've heard the expression, "No man is an island." Jesus set up His Church to follow His example, and help one another. On a very important occasion, one of the biggest feasts of the year, Jesus was at a big Church dinner. Actually, it was His last, a going away party. He stopped to wash his disciples feet because they needed it. Practical things. Even little practical things, that can make a big difference. You would think that Jesus, being God, wouldn't need our help. The mission of Jesus and His Apostles, the first pastors in the Church, was a very important one. What could be more important than the salvation of souls and preaching the Good News? Actually, during His public ministry, His mother Mary and some other women supported Jesus and His Apostles, the first pastors, by praying for them, and doing practical things for them. No doubt things like preparing food, mending and washing their clothes. At the same time, they themselves were growing in wisdom from the teaching and example of Christ. It would have been difficult, if not impossible, for Jesus and His apostles to do what they did without their help and support. One time, Jesus was attending a big wedding celebration. Mary His mother noticed they ran out of wine, and told her Son. Jesus probably wouldn't have worked His first miracle of changing water into wine unless Mary had been helping back in the kitchen. Mary and these holy women are a good example for the wives of pastors in their calling of supporting their husbands in the ministry. Because they were faithful in the little things, God gave them the strength and grace at a very difficult time. That's because sometimes, our vocations can involve difficulties, sacrifice, even suffering. When Jesus died for our salvation, Mary and a few others with her remained faithful at the cross. It wasn't easy. Jesus was suffering and dying. His Mother and His few friends standing there were also suffering terrible grief and pain themselves. Their faith was seriously tested. They were helpless to say or do a thing to stop the awful crime, because soldiers were stationed all around. I think, that when Jesus looked down and saw His Mother and His few faithful friends, in spite of His terrible suffering and pain, this caused more pain to Him, knowing how much they too were suffering because of Him. But I also think, this must have given Him some encouragement, some consolation... His friends encouraged and inspired Him just by being there. Even though it was a most difficult time, one that most of us will not experience to the degree Mary and the holy women did, they were truly blessed. They were among Jesus' closest friends. Being the wives of pastors also has its rewards. Especially in Heaven. But the reality is, it can be a difficult vocation to live out here on earth. In a difficult vocation, God gives grace, but He expects others to help. He wants us to help one another. He rewards those who help carry one another's burden. Just because the pastor has a ministry, and his family has to look good for the church, doesn't mean everything is rosy, sweet, and honky-dory. Just the opposite is really the case. There are many sacrifices involved, that involve the whole family, that most people in the parish don't have a clue. For example. A pastor usually has a regular schedule of services, meetings, Bible study and sermon preparation. And organizing the singing, Sunday school, events, etc. It's the nature of his job. And the smaller the congregation, the more hats he has to wear. He has to become a jack-of-all-trades, which may include paying the bills, repairing the roof, maintaining the buildings and mowing the grass, just to name a few. And on top of that, he may have hospital visits, sick calls, counseling, pastoral visits, filling in for other pastors, building projects and many other small and large emergencies. Which interrupt family plans, personal time together, even weekends and vacations. Again, most people don't have a clue. Except pastors, wives of pastors, and their children. Now the pastor is not going to share a lot of what's going on with his children. Unless it was confidential, such as private or professional counseling, he may share some of this with his wife. He may want someone to talk to. He may need to get it off his chest. He may look to his wife for understanding and support in this. Which means she may end up sharing in some deep emotional pain. She may eventually feel like an emotional dump. She's dealing with stuff she feels she really can't tell anyone else but the Lord in prayer. Many times when the pastor and his wife would like privacy and intimacy and time together, their plans are interrupted. Sometimes the only time they have left to be together is discussing issues like ministry, spiritual, financial, and health, and parishioner problems, besides the lives and behavior of their children. If they even have time for that. It would be easy for me to say that both the pastors and the wives of pastors should get counseling and plan their schedules and hire more help at church or get people to volunteer, and yes, that should be the goal. Even Moses' father-in-law Jethro straightened him out on this point, telling him to appoint 72 elders to help him. It's easy to tell people what to do. "Talk is cheap." But we live in the real world. Starting a parish, running a parish - especially in the beginning when it's small - can leave very few options. And unfortunately not everyone in a parish is willing to ease the burden of others. They go to Church to receive and not to give. If they even go to Church. Did I mention that plans can be interrupted? Especially on weekends. Weekends can really be shot. That's because in the first place, while everyone else is taking a break from a busy week of work and school, the weekend is the pastor's busiest time. I know about an older pastor who has a busy Sunday, with services, preaching, etc. He takes off another day of the week as his weekend, usually Monday. He'll grab his fishing pole, pack his Jeep, and head off into the mountains to hike to remote lakes where the fishing is really good. Sometimes he camps out a few days. So he gets a good dose of exercise, fresh air, and good fishing, so he can come back and fish for the Lord with renewed energy, health, vim and vigor. Many pastor don't seem to know they have to take a break. The wife of a pastor is married to the pastor. Unfortunately, she can't always get away as easily as the pastor. This is her special calling as wife and mother. It's her first ministry for the Lord. Which is why mothers deserve appreciation more often than just Mothers Day in May. Wives of pastors are often asked to be involved, even take charge, of various ministries at the Church. And while everyone else is demanding that she and her children live to an impossibly high standard, she can be unbelievably stressed and over-worked, she can reach a state of where she feels helpless, unable to cope, overwhelmed, even embarrassed or humiliated. This can be very emotionally draining. Maybe it's affecting her physical and mental health. Even to the point of being burned out. Burnout happens. We hear that pastors sometimes get it. The wives of pastors can get it too. That is why wives of pastors need encouragement, inspiration, and the prayers of the community. Way BEFORE it gets to that point. And not just talk. Action. Good works. Support. Actual support, helping out in ways that she and her family would really appreciate. How would you know that? How can you find this out? Real easy. Simply open your mouth and ask her. Start by becoming a true friend, not her critic. Follow the example of Mary, Jesus' mother, who even at a big wedding, was back in the kitchen to notice they were running out of wine. Follow the example of Jesus, who even at a big Church dinner, actually His last going away party, stopped to wash his disciples feet because they needed it. Telling her you're praying for her and her family while giving her a fruit basket. Or one with personal items like soap, things women understand. Or a simple thank you card. Or all three. A card. A gift. Along with best wishes and prayers. Do You Want to Make a Good Impression? Do You Want Your Card or Gift to Really Stand Out? We know how important it is for the pastors - and the wives of pastors - to receive our encouragement and support. Now the question is, how can you make a card or a gift that really stands out? Imagine that in the month of December you get a dozen Christmas cards from people you know. But one of them stands out, because it's from a close friend. Ask yourself, what makes that one special one stand out? Is it the color, the writing, the envelope, the picture or photo, the message? Most likely it's because it's coming from a friend. A phone call from a friend stands out from the rest. The same with a visit, a dinner, with family and friends you love, and like to be around, to talk and share with. Now, put yourself in the shoes of the wives of pastors. Who would they probably like most to hear from? You got it. A friend. Today, there are many people who don't operate at the level of their best performance. What I've discovered, many people are lonely. O sure. Some people look like the life of the party. Social. Happy. Lots of people around them. Maybe they're a big sports figure or a Hollywood star. But take away the fakery, and inside, they're empty and hurting. Often, wives of pastors can be very lonely too. O sure, they may be involved in all kinds of activities in their home, parish, and school. But maybe, just maybe, they're hurting deep down inside. Maybe, there's no one they can talk to, no one who will listen, no one who will take the time to understand their problems. So why do many people not operate at their best performance? Why are they so lonely? Because they don't have a friend. A friend they can trust, share with, laugh and cry together. A good friend, who helps them become a better person. A good friend, who encourages and inspires them, and who has earned the right to point out the things that they could work on to improve their lives. Before he was king, David had a close friend Jonathan. They helped each other in many ways. Jesus said to use your material goods to make friends. So instead of throwing money at the problems of life, we should use it to develop relationships. Good friends are hard to come by. It takes time to nurture a friendship. Do you really want to make a difference in your parish? Try using the F Model. The Friendship Model. Become God's friend first, of course, that should go without saying. And be friendly, if possible, with everyone. In the case of the wives of pastors, maybe your pastor's wife needs a good friend. Maybe you can pray for that. Maybe, after prayer, God may want you to become that friend. You become a true friend, not just by talk, but putting forth some time, effort, energy, and lots of prayer into the matter. Now that is powerful. That can make a big difference. One true loyal friend can make all the difference in the world. I wrote a little bit about this in a Friendship Poem. Too many of us think that money would solve our problems. We want to fix everything with more money. We could all use more money. We want the simple, fast, cheap, easy fix. God gives us all the resources we need to make a difference, and lots of times, it's not the money. In fact, if we have money, Jesus tells us to make friends with it. Telling us that friendships are more important than money. Sometime, we think it'll take too much time and trouble to make friends. But really, being a friend may be easier than you think. You'll probably end up receiving more than you give. It can actually start quite small, with a little prayer. Sometimes a little kindness can make a big difference. A kind word. A little card or note. A little gift. And yes. Sometimes, even an apology. Don't worry, it happens to the best of us, we make mistakes. And yes, eating humble pie isn't always fun. But it's sometimes the right thing to do.